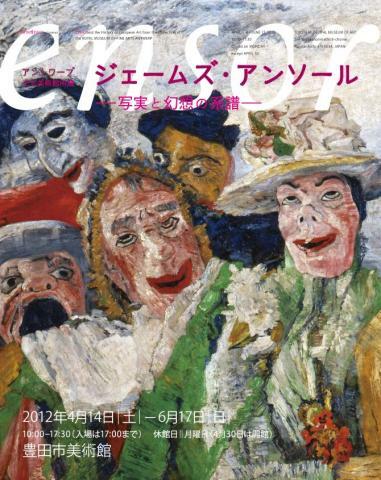 The Ensor collection of KMSKA will reside in Japan from 14 April to 17 March 2013. The travelling exhibition Ensor in Context will call at five venues: Toyota Art Museum, Ehime Art Museum, Togo Seji Memorial Museum, Iwate Art Museum and Okayama Art Museum. The package for this show consists of 73 paintings and 59 drawings and engravings from the KMSKA collection. The exhibition does not focus on James Ensor alone. As the title already suggests, the work of Ensor and his contemporaries provides a starting point for an exploration of the history of Western European art. Furthermore, the exhibition delves into the motif of the grotesque. In this respect, Ensor drew inspiration from his discovery of the work of the Japanese painter and graphic artist Hokusai. KMSKA has made carefully considered selections from its collections of Old and Modern Masters for the two components of the exhibition. Visitors in Japan will be able to admire work by, among other artists, Jan Gossaert, Pieter Brueghel II, David Teniers II, Gustave Courbet, Henri Fantin-Latour, Emile Claus, and George Hendrik Breitner.